Playing top set in multi-way pot, 3rd to act out of 4 players. 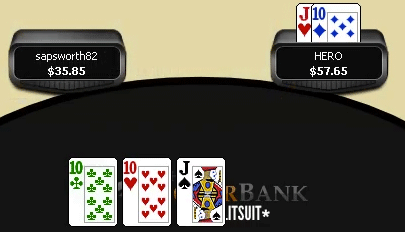 3betting with a suited connector preflop and hitting bottom end of a straight on the flop. Board ends up double-pairing (possibly counterfeiting Hero's straight) and Hero faces a shove. Set mining with 88 preflop. Hit full house on the flop against 2 other players. Remain wary when facing a lot aggression, and be prepared to bet bigger against fishier players. How to play when you hit a monster hand on the flop, usually when up against multiple opponents. A strategy video dedicated to maximizing value, along with appropriate bet sizing + hand planning. There's plenty of discussion on preflop strategy in this video too, so it's not just post-flop analysis. Check out Trips and Sets (another vid by SplitSuit) for more strategy on playing those kind of hands. It's important you know how to play your monster hands well, as getting value from big hands makes up a large part of your winrate. If you can't maximize value with your strong hands, your winrate will crumble. Think about it – missing out on money you should have won is exactly the same as losing money by playing badly. Missing out 80bb because you didn't get as much value as you should have done is much worse than losing 20bb because you made a bad call. Playing as optimally as you can in these situations is vital. What a monster flop looks like. Pretty fun.